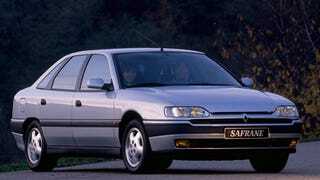 ...the early 90’s French hightech barge that is the Renault Safrane, ideally in V6 form. There is something about their styling I really like. Unfortunately most of them ended up in junkyards years ago due to their rock bottom prices, so its next to impossible to find a Phase 1 car with the V6. I wouldn’t even care if its a manual or automatic, I’d be happy with either of them. Someone go find me one for cheap money!